So I was at the hospital the other day and I ran into this cardboard cutout promotion for a fruit smoothie by a company named Odwalla. As you can see from the photo, it was promoting a beverage called, "Mango Tango" and it bragged, "1 Whole Pureed Mango per 450mL". Curious, I picked up a bottle and had a peek at the nutritional facts panel. That Odwalla Mango Tango had 0% of my percent daily value of Vitamin C.
That seemed strange given that I would have thought mangoes are full of vitamin C and the cutout said that there was a whole pureed mango in each bottle. Looking up mangoes, I found that a whole mango actually contains 96% of my percent daily value of Vitamin C.
So shouldn't that be how much is in Odwalla Mango Tango? Well perhaps as a commenter had noted on my blog post on KD Smart, the processing removed all the vitamins. Or perhaps something's up with their secret formula. Either way though one thing's for sure. 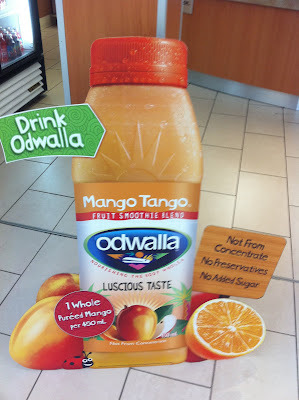 Odwalla's trying to sell products on the basis that drinking them is tantamount to drinking whole fruits, replete with all of their nutritional cache and benefits and the fact that those benefits appear to be absent to me strikes me as ethically challenging. So nutritionally what's in Mango Tango? Mango flavour, water and an astonishing 15 teaspoons of sugar per bottle.